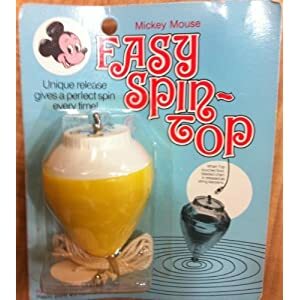 Thought some of you collectors might be interested in this Mickey Mouse top for sale on Amazon. Seems to have the Colombian stub on the crown. Seems to have the Colombian stub on the crown. Actually, it has a little chain pivot (like the one to turn on ceiling fans). You throw the top with the string attached to the crown, so it spins hanging in the air. A sharp tug will disconnect the string and free the top to spin on the ground. 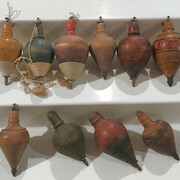 Tops with pivots where called "girl tops" in the 1930's. That's a nice group of pivot tops. I couldn't see the Facebook page so I don't know to whom they belong.